The NDS/NDA/NDP series of dip switches from Dailywell are single pole, single throw switches with slide action. Electrically rated to 25mA at 24VDC for switching with a carry of 100mA at 50VDC and a mechanical life of 2,000 make and break cycles for each circuit. The NDS/NDA/NDP series of dip switches from Dailywell are single pole, single throw switches with slide action. 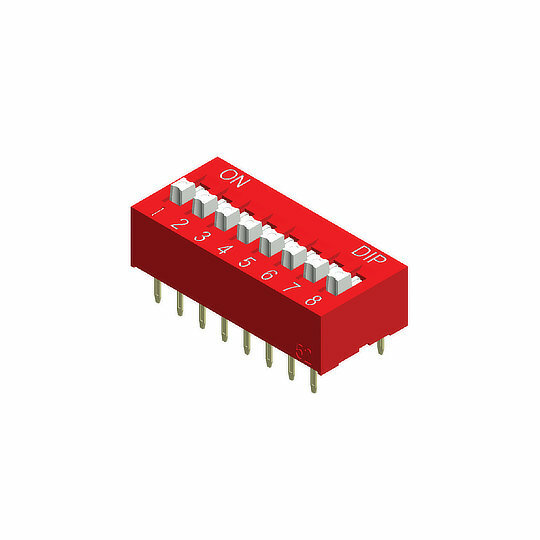 Electrically rated to 25mA at 24VDC for switching with a carry of 100mA at 50VDC and a mechanical life of 2,000 make and break cycles for each circuit. Designed with a choice of 2 to 12 positions available with raised or recessed actuators for the NDS/NDA series or a choice of short and long key actuators for the NDP series. All are available with straight or 90° PC pin terminations in blue or black cover colours and are rated for vibration and shock to MIL-STD-202F methods 201A and method 213B, condition A respectively. The NDS/NDA/NDP series are perfect for applications such as Home Appliances, Computer Peripherals, Industrial Control Systems, Automatic Machine Control and Audio-Video Equipment.